Garrett Neese/Daily Mining Gazette The site of a proposed addition to the Houghton County Jail behind the courthouse is seen Tuesday. The County Board will host several informational sessions in October regarding the expansion proposal on the November ballot. 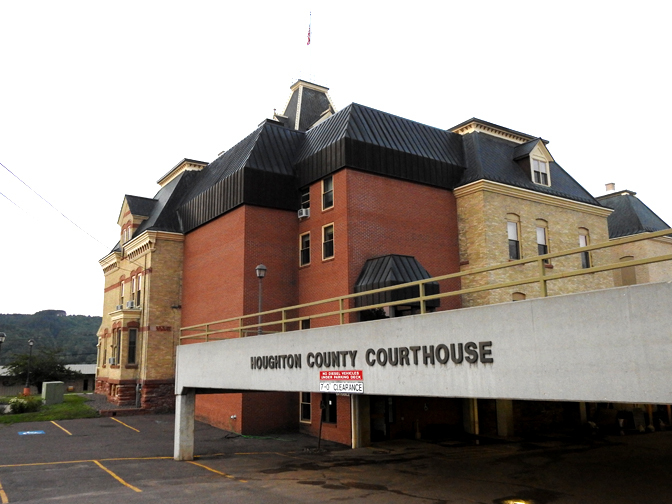 HOUGHTON — Houghton County voters who want to learn more about the proposal for a jail expansion won’t have to travel far. The county will hold several hearings throughout the month of October in advance of the November vote on a millage, County Board Chairman Al Koskela said at Tuesday’s meeting. Participants would include Sheriff Brian McLean, Undersheriff Kevin Coppo, Jail Administrator Doug Hebner, architect Karin Cooper of U.P. Engineers & Architects, Administrator Eric Forsberg and the board member from the hosting district. “We’d like to spread them around, so that everybody would have a chance to put their two-cents’ worth in before the election,” Koskela said. UPEA is preparing a one-page fact sheet, as well as a list of common questions to be posted on an upcoming website about the proposal, Forsberg said. The meetings will begin with a PowerPoint presentation before being opened up to questions from the public. The $11 million, 64-bed addition to the jail would be built behind the courthouse on the site that is now a parking deck. In July, the board approved language for a millage with an estimated annual rate of .751 mills. The estimated millage would be .7439 mills in 2019. •Oct. 3: 7 p.m., Calumet, at the commons area of the Public Schools of Calumet, Laurium & Keweenaw. •Oct. 9: Laird Township (tentative). •Oct. 10: 6:30 p.m., Chassell, Chassell Fire Hall. •Oct. 17: 7 p.m., Lake Linden, at the Lake Linden-Hubbell Public Schools gym. •Oct. 24: Houghton, in the Houghton County Circuit Courtroom. More dates and times will be scheduled and announced.